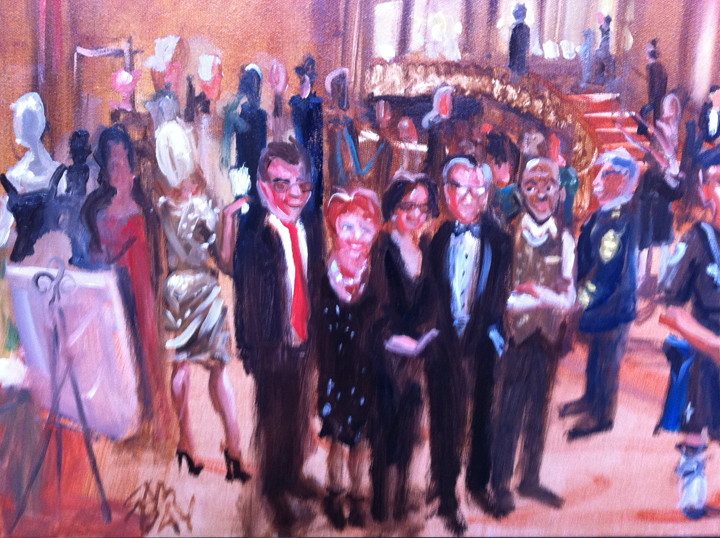 Every time I do a live event painting for a charity auction, I show up early enough to paint the venue, and then when the guests arrive for cocktails, I can just paint people until they’re called to dinner for the live auction. As my painting is auctioned off, I go on stage and do the Vanna White thing. The buyer is then welcome to meet me back in the lobby after the auction to have his or her face, along with a guest or two, painted into the scene. 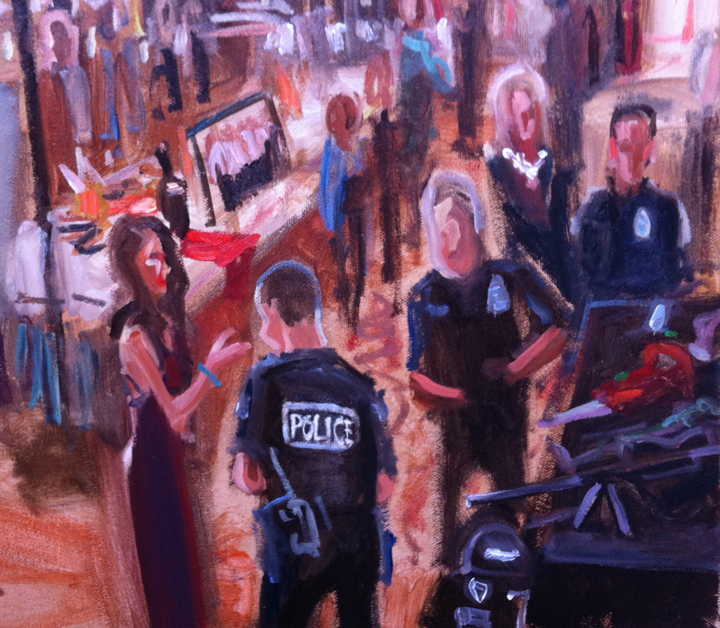 The Seattle Hotel Association’s gala Evening of Hope benefits the Seattle Police Foundation, which allowed me to paint some things I don’t usually put into a picture of a cocktail party. 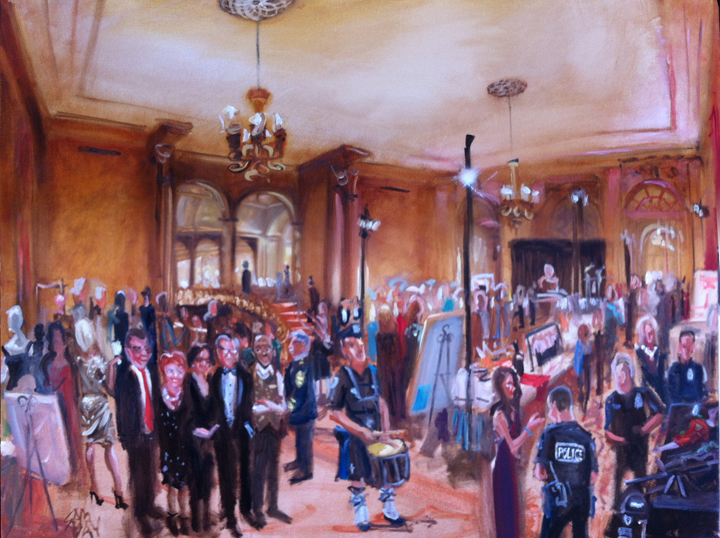 I really wanted to put the police dog in the painting, but I heard him more than I saw him; he was down in the lower lobby. Alas, they kept the horses outside. 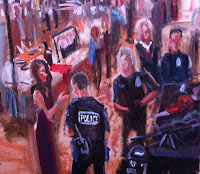 There was a bomb squad robot at the other end of the room, and the SWAT team had a radio controlled crawling camera dodging peoples’ feet, but those didn’t make it into the painting either. However, I was fortunate enough to be placed next to this cool table of “small arms.” I asked what one of the rifles was called, and got an exhaustive answer detailing its range and capabilities. These were all very expensive, state of the art tools, essential to some very expensive programs. The Seattle Hotel Association was gathered to raise funds to equip them, helping to make Seattle a safer place to live and visit. But it turned out the buyer of my painting was more interested in the architecture. The magnificent venue is the Olympic Fairmont Hotel, one of the grandest spaces in the Pacific Northwest. Built in 1924, it quickly became the premier destination in the region for Presidents, foreign dignitaries, and celebrities. But after decades of age, and the recession of the 1970s, this grand dame was in need of a facelift— and new owners. In 1981 she became the Four Seasons Olympic Hotel (and later, in 2004, the Fairmont Olympic). In 1982, the black lacquered Spanish Foyer was stripped down to the beautiful walnut paneling we see here. And the man who bought my painting reminisced that he had been the one to make that all happen. In addition to the hotelier friends he asked to stand in, he also requested that I paint in another friend— a waiter who had served in this room for decades.